Wonderful. You'll clash spectacularly. I love the key as a clasp idea. Oh wow, I was saying only the other day that I really needed a new walking stick, mine is so battered, and now none I can buy will ever compare to a *flamingo* one. You two are going to make a very eye-catching pair! Fabulous job! I'm so glad to see a brightly colored steampunk outfit. Not that I don't like browns, blacks, plums, etc, but I've been considering making a steampunk Pearl Forrester (of MST3k) which would feature a lot of light green. You two will be be a purrfect pair. 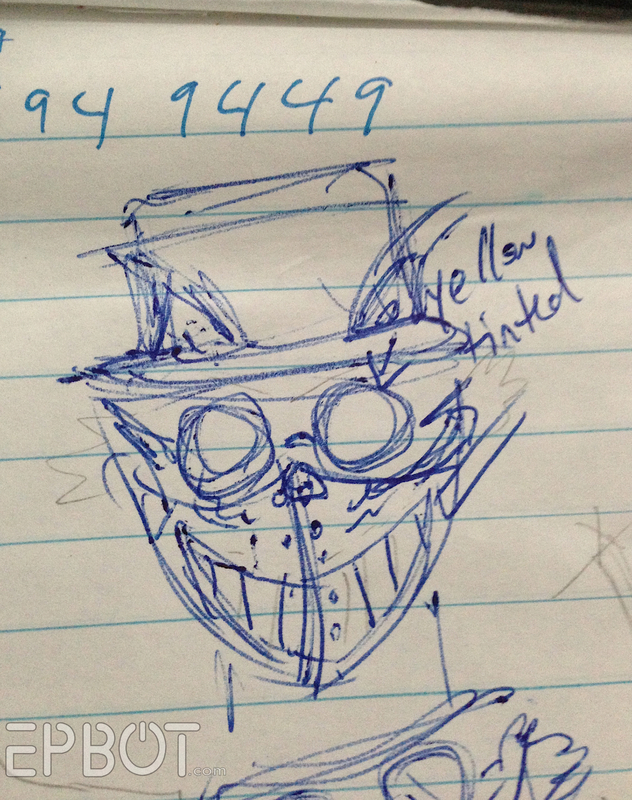 I liked the slightly more angled grin on the sketch a little better. It might have scared kids though. 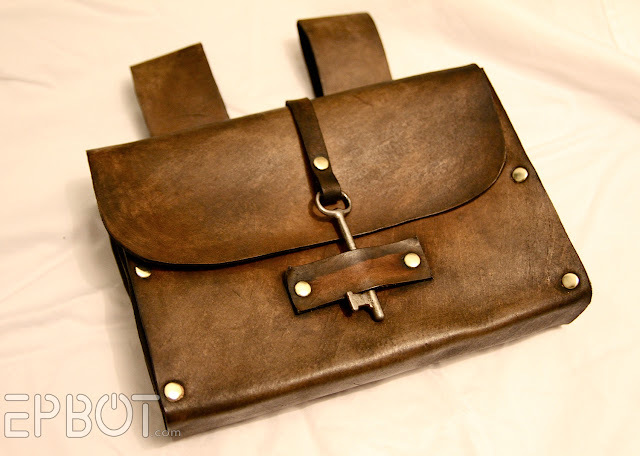 The satchel is beautiful. And that cane--wow! Will we get to see pictures of him in the dark for the full effect? Hope so. Can't wait to see pictures of your whole group. You guys are going to be fantastic. You two are like, the coolest couple ever. A flamingo cane??? SHUT UP, I say. I can't wait to see pics of you guys in action! I LOVE it! That cane is amazing! And I'm drooling over all the details on the hat!. That cane is SOOOO cool!! Totally worth the little bit of extra effort! Now I want one... My father-in-law does a lot of wood-working, so I may be able to con him into that! You guys are going to be the talk of the town! I can't wait for more pictures of the rest of your group! 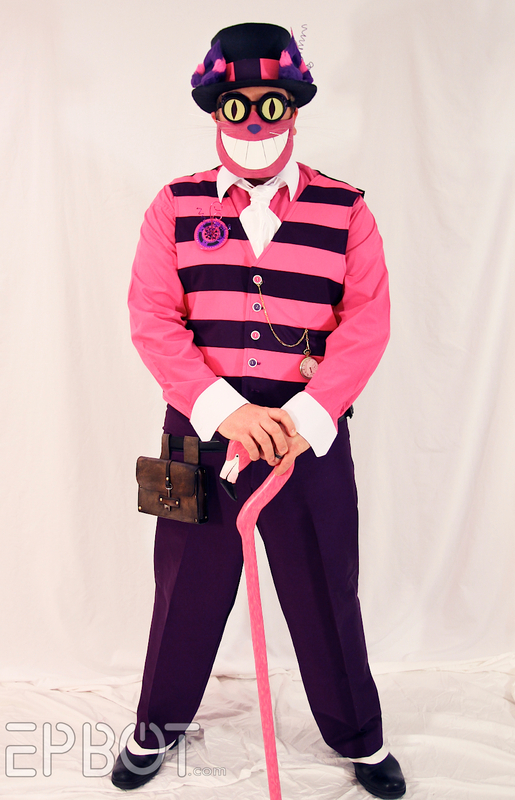 love the whole costume and the cane is AMAZING!!! I love the costume, so much work and detail. I love both of your costumes! John did an excellent job on the cane! I love that cane! Totally perfect. I would have loved to see a big fluffy tail with this... maybe attached to his sleeve so you could see it from the front? The awesome cane really makes up the difference though. Absolutely amazing. In my mind, the two of you are magical crafting wizards. And it's another wonderful work of art! You two amaze me with your creativity! And that cane... Ah. Maze. Balls!!! That's amazing!! I'm so impressed with John's sewing skills. Bravo! You and John are so talented! Standing ovation! Ooh, the cane is faboo! Are you KIDDING us?! John sewed strips of fabric together to make a striped vest?! He carved a flamingo cane in less time than it takes me to do the grocery shopping?! What sorcery is this?! How can one person contain so much awesome? Both his costume and your costume are amazing, and I'm so happy that you're back and that you shared the photos with us. I hope you have a wonderful time at DragonCon. Can't wait to hear about it and see the pics when you get back! Good GAWD you creative geniuses you! And that you're sharing all this is really appreciated too. Jen, you and John need to start whipping up those walking sticks, and be prepared to ship them all over the world, because, I would happily drop $100 for one that I could use! 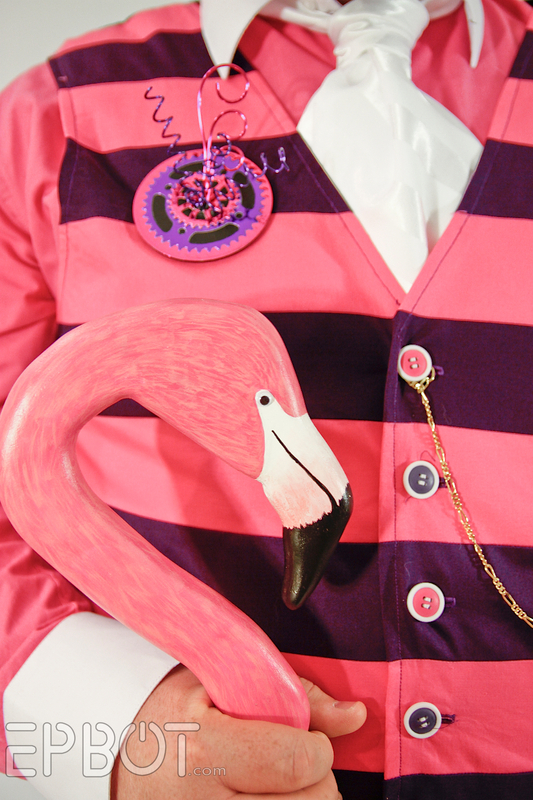 That flamingo walking stick will haunt my dreams now! 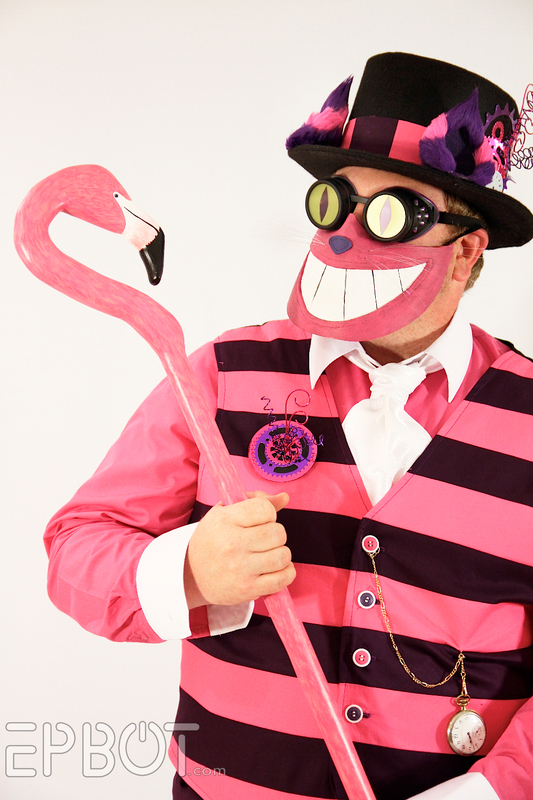 And this is why you two are a perfect match for each other: you say, "I wanna be steampunk White Rabbit" and Jon helps you create it and then he says, "I want a flamingo cane" and you go and help him create it. SERIOUSLY. That thing is ridiculous and amazing all at once. It's my favorite piece! I hate to be a little black rain cloud, but singing leather in the oven is only a useful technique for hang-on-the-wall-type of leatherworking, as it dries out and damages the leather, and will shorten the life of the pouch. There's a lot of information out there on finishing effects for leather that won't damage it - yes, some of it is really old, but its still good. Please provide cane details/tutorial! Love, love, love it! Amazing how many times John has gone "eh, let's just try this" and it's worked out. He's a wizard, Jen! This outfit and the Dreamfinder one should hang side by side in a Disney costume show. Can't wait to see the con photos! looks like you could make a bit just selling flamingo canes! the costumes are splendid and shiny. I think you'll both be the belles of the con. Wow! The word amazing is going to get used up describing how talented you two are. It is all awesome, but that cane kicks it up another notch. Just like you guys, not satisfied with awesome, must go beyond with all the fabulous details. The men cheered, the women fainted, and the children waved multi colored flags! Hey, just wanted to say that I'm excited that you're back and excited to see more cool projects like this and to follow your Convention and Disneyworld adventures. I guess I can go back to drooling over all the cool places in Disneyworld now and wishing I had the time and money to get down there. Quick question, the leather bag is really cool and I LOVE the use of the skeleton key. I've been looking for some of those, did you just happen to have one or get it off of ebay? Or is there actually a place selling those? I really dig the ears. They look just incredible! Have fun at DragonCon. We're going to MetaCon this weekend, so we'll be exhausted this weekend as well. Go to ALL the cons! 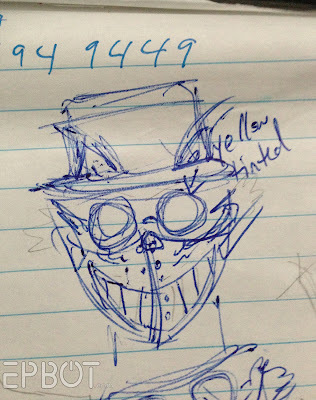 The only thing creepy is the mouth bit lol.. but its supposed to be! and i love the cane holy cow! I am so excited to see pics at dragon con! You guys are Geektastic and you make my day, everyday! P.S. John's sewing skills are blowing my mind as usual. ... but dat cane doe! Wow, just Wow!!! and yes, it is totally creepy. My kids all came in to check out what I was looking at online and each of them (4)shouted "What's that?!?! Creepy!!" But you have amazing skills, I love the leather pouch and all the little details that make your costumes so unique. Yes, it is a bit creepy. On the other hand, John can do any facial expression he wants, and no one will be the wiser. Any. One. You. Want. Love all the details and the overall look. There are not enough adjectives to fully describe how wicked awesome the costume is. Bravo! You guys are very talented. I purposely came to your site today to see if you would be here this weekend. I hope you both have a great time. I love the gears and springs on the hat! They are so pretty! Ooh, it's creepy AND pretty! I love it! I can't describe how happy I am to have you back!! Both of your outfits are awesome and that cane is absolutely incredible! Enjoy Dragon Con -I am so looking forward to seeing all the updates! So i have an adorable elderly aunt (mid eightiesish) who anthropomorphizes things (teddy bears, dolls, etc., etc.). She has a cane with a carved figurehead that she has named growly, who will attack your feet if you do something wrong. Just going to add my voice to the "you should make and sell canes" list, because i'm thinking how much delight she might get at adding a hot pink flamingo friend to growly and if it was affordable i might totally try to get her one to test this out. Chess has always been my favorite (since purple's my favorite color and all!). I am so impressed by both costumes! You guys did and awesome job! Happy anniversary as well! We really would be food friends, since our anniversary is Sunday! Have a blast at DC and welcome back! I LOVE John's creepy Cheshire! He's so rad man! That is SO COOL you guys!!! There aren't even words for how excited I am to have you back - and I can't wait to live D*C vicariously through you guys - but but but, I am going to be in Canada and America all of summer 2016 - SO D*C 2016 HERE I COME!!! OMG, the eyes are so creepy!! But that aside, it's a completely awesome costume. And the flamingo cane? That totally makes it!! Very creepy, indeed! There is something about this particular costume that I do not care for but I am in no way questioning your dedication or your skills (either of yours). Wonderful job and you deserve all the admiration you've received. My favorite parts are the whiskers and the cane. I think I would only add some tuffs of fur to the mask's cheeks and maybe a big fluffy tail rigged to stay up in that perfect curl somehow. Best of luck! I love it! 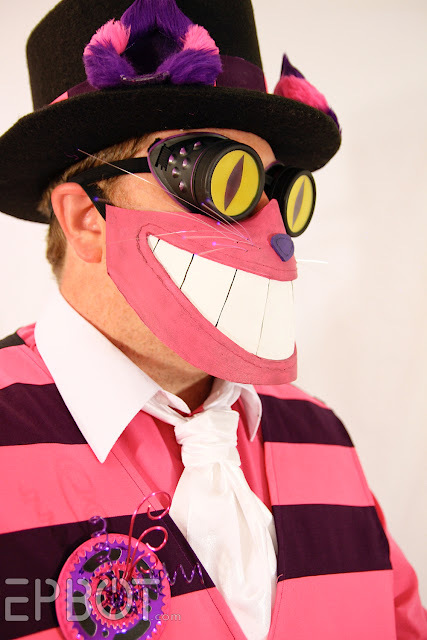 I don't think you can have a Cheshire Cat based on the original Disney version that isn't creepy - because he is creepier than all get out! Even now he freaks me out a little! 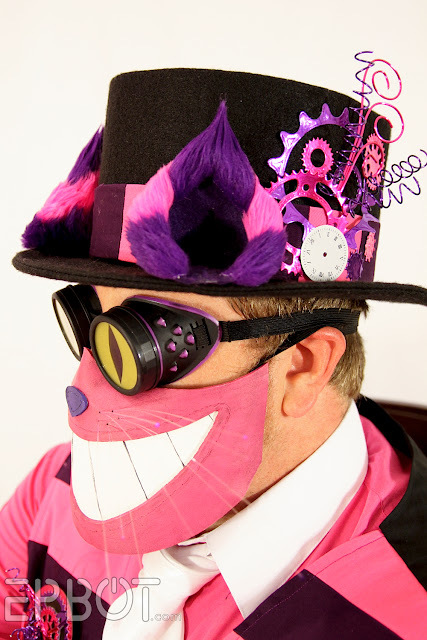 I especially love the gears and things on the hat! ... I am speechless ! Both costumes are beautiful and so well done and ... planned and everything ! Amazing! Can't wait to see your photos from DragonCom as I have been following your progress vicariously on Twitter! 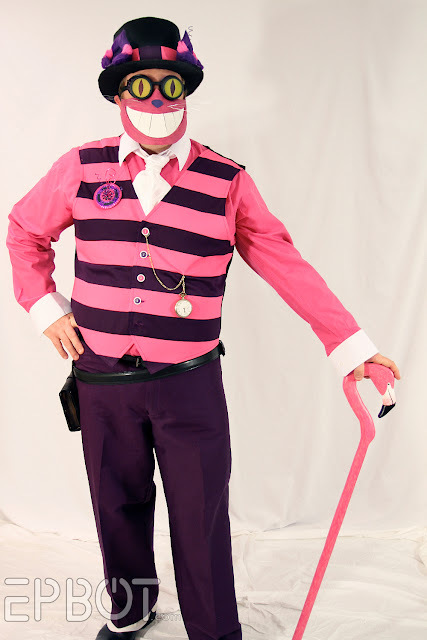 I want that cane - I made myself a flamingo umbrella once, but it was nothing like your cane! Marvelous job, both of you! ALL the details, absolutely fantastic! And welcome back! Fibre-optic whiskers are beyond genius! I hope these amazing costumes are going to get a second run for Halloween! 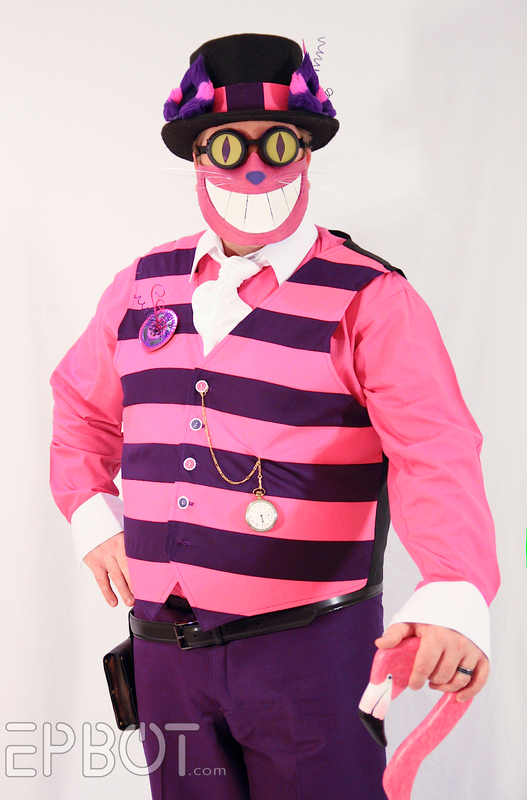 I really love the crisp and colorful steampunkiness of the Cheshire cat look - it's so refreshing and different from the many weathered costumes. Great job on the flamingo, too!! Even creepier in person! Fabulously creepy! And Mom & Dad looked great, too!! No one will notice any creepiness because they will only be looking at that fabulous cane! great outfits, wish i could have seen them at the Con! Any chance y'all will be recycling these costumes at Disney this Halloween? Cosplay this good should get as much mileage as possible! Is it wrong that I can't wait for you to get home so I can see more pictures? lol I live just outside of Atlanta, but I wasn't able to go to Dragon*Con. Can't wait to see your shots! I'm speechless. And I mean that in the BEST way possible! It's amazing (really! ), but he needs pink furry muttonchops. Just saying. Wish I'd thought of it before Dragon*Con. Please do make a tutorial for the leather bag if you can!! WOW! OMG WOW!!! LOVE the cane! Outstanding job, guys! Very impressive. Very talented! Both outfits came out great! Hope the fun was as much as you expected. You are both Wizards. Seriously. Are you serious? Color me inspired. And also jealous, but mostly inspired. I think. 2. Wow. These costumes are absolutely incredible. I am so impressed/awed/slightly intimidated by your skill and the sheer amount of work you've put into them! Which brings me to..
3. What do you do with these costumes after the cons? You mentioned displaying John's hat in his man-cave, will you be doing the same with pieces from your costume? If you do, would you mind doing a post on it? (I have a bit of an ulterior motive for this - my husband made an arc reactor for a Tony Stark costume, and ever since, it's just been tangled up on a shelf, which gives me the Sads. I would love to see what you do with your costume-related art (and it IS art!!)). Interested in reading about the leather bag! Did you ever post a tutorial on the satchel? I love it! I was wondering what paints an sealer you used on this marvelous walking cane. I’m a bit obsessed with flamingos & would love to see if someone local could make one similar to the one John made. If he wouldn’t mind. Continued success in all your endeavors. The paints were cheap acrylic craft paints, then we sprayed a clear sealer on it - probably lacquer, thought it's been so long I don't remember exactly, sorry!